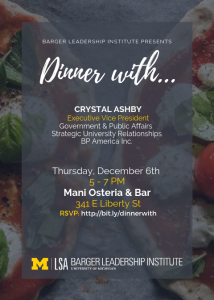 The BLI Dinner with... series offers a valuable opportunity for Leadership Fellows to enjoy a dinner with a BLI stakeholder and get a behind the curtain view of their leadership journey. Dinner attendees build community, share leadership interests, and cultivate meaningful connections in an informal setting. We are excited to announce this month's special guest is Crystal Ashby! Crystal serves as a Director on the boards of The Executive Leadership Council, Genesys Works (National), and the Holocaust Museum Houston. She is a member of the University of Michigan College of Engineering Leadership Advisory Board (LAB) and chairs its Diversity, Equity & Inclusion (DEI) External Advisory Council. She is an Alumni Work Group member for the Barger Leadership Institute in the College of Literature, Science and Arts. Crystal is also a lawyer who transitioned from practicing law into key business partnerships. Until 2015 she was a leader at BP America holding various executive roles including: Executive Vice President for Government & Public Affairs, Senior Vice President – Strategic University Relationships, Managing Attorney – US Retail (with a stint in Rotterdam), and Senior Advisor to the Global Compliance & Ethics Officer based in London. 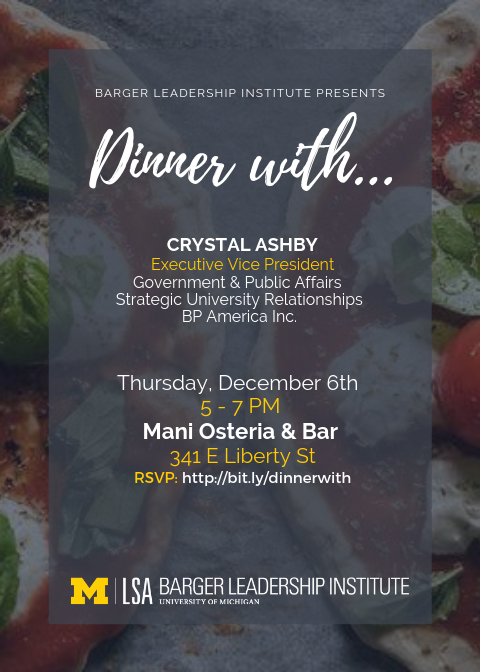 During her time at BP she also was a member of the BP America Leadership team, served on various internal BP Boards, was a member of the BP America Diversity & Inclusion Council, served as executive sponsor to several affinity groups and was BP’s Executive Sponsor to the University of Michigan. Prior to joining BP she practiced as a litigator in Chicago, Illinois.